[Go Back] [New Search] Details for Shinsui Ito (1898-1972) "Yamato Nadeshiko"
Impression Excellent - very good … Printed on a thick paper. Embossed. Colors Excellent - very good. Condition Very good … Slight creases and wrinkles, a foxing on the middle left background, slightly soiled, a pin sized hole on the top right corner. 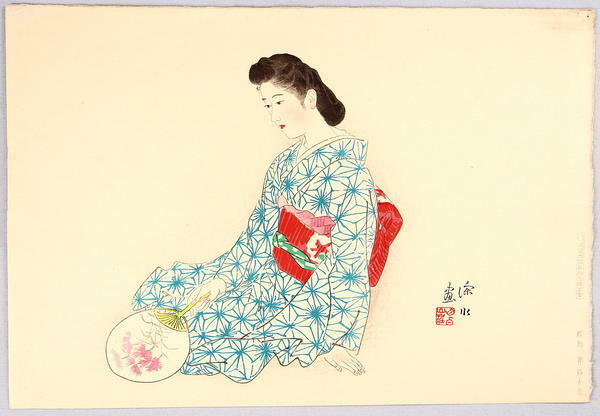 Description "Yamato Nadeshiko" (Ideal Japanese Woman). A woman in light summer kimono is taking a rest. She has a round fan with pink Dianthus (Japanese name of this flower is "Yamato Nadeshiko", also.) pink flowers on her hand. Note Printer Ono Gintaro. Watanabe copyright seal for 1942-45.